In the midsize SUV segment there are many vehicles to choose from, including the 2018 Kia Sorento and Sportage. In order to help our customers decide between these two great SUVs, we’ve put together a comparison of these two vehicles. For the 2018 model year, Kia added the option of blind-spot monitoring, rear-traffic alert, an emergency braking system, and lane-departure warning system in the LX model Technology package. The Kia Sorento also received an upgrade for the 2018 model year; it now features a hands-free power liftgate and power folding side mirrors are now standard on EX models. The Cool and Connected Package adds Apple CarPlay, Android Auto, and dual-zone climate control in LX models. If you’re looking for a powerful SUV that’s fun to drive, look no further than the 2018 Kia Sorento. It features a 2.4-liter 4-cylinder engine that boasts 185 horsepower and 178 lb-ft of torque. When equipped with the 2.4-liter engine, the Sorento provides an EPA estimated 22 city and 28 highway miles per gallon. Drivers can also upgrade to the 2.0-liter turbocharged inline-4 engine available I EX and Limited models. This powerful engine provides 240 horsepower and 260 lb-ft of torque. Car shoppers can also pick the 3-row EX and Limited models, as well as the SX model that comes equipped with a bigger 3.3-liter V6 that puts out 290 horsepower while still providing drivers with a fuel efficient 18 city and 25 highway miles per gallon. The Kia Sportage, on the other hand, comes equipped with a 2.4-liter inline-4 that provides 181 horsepower and or a 2.0-liter turbocharged inline-4 that puts out 240 horsepower and 260 lb-ft of torque. The new 2018 Kia Sorento offers drivers with many convenient features including extra storage spaces and cubbies. In the Sportage, drivers can expect about 30.7 cubic feet of cargo space with the rear seats up compared to 60.1 cubic feet with the rear seats folded down. Unfortunately, if you’re looking for third row seating, the Sportage is not for you. The Sorento, on the other hand, provides a convenient third row, plus about 38.8 cubic feet of cargo space behind the second row, and adds another 11.3 cubic feet behind the third row. Standard in the Sorento is seating for five with a 40/20/40 split-folding second row, but drivers can opt for models with third row seating which can carry up to seven. These models have a 50/50 split third row. Step inside the 2018 Kia Sorento and you will notice a plethora of standard convenience and tech features. Standard in all models is a rearview camera, six speakers, USB ports, and Bluetooth audio. Drivers can upgrade to enjoy features such as a 7 or 8-inch infotainment and navigation system along with Android Auto, Apple CarPlay, and dual rapid-charge USB ports. Also available is a 10-speaker Infinity surround-sound audio system, panoramic sunroof, push button start, and hands-free power liftgate. The Sportage also provides drivers with many standard features including stain-resistant seating in LX models, a generous 5-inch touch-screen display equipped with a standard rearview camera, 6 speaker audio system, Bluetooth connectivity, and a drive-mode selector that features Sport, Normal, and Eco modes. Upgrade to EX models and you will notice cross-traffic alert, a 7-inch infotainment system, leather upholstery, and dual-zone climate control. When comparing the Kia Sportage with Kia Sorento, it all comes down to personal preference and driving needs. 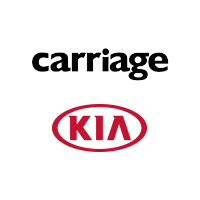 Visit Carriage Kia of Woodstock today to test drive any available Sportage or Sorento and let our professional and courteous sales staff help you compare models.